1.4 Ronald, the Obligatory Rival! First of all, this game does not play like a main-series Mega Man Battle Network game. It's not an RPG, you do not directly control the character you play. In fact, there's a lot of control abstraction in general. The game is built around a series of tournaments (the BattleChipGP) which is connected to an overarching plot. Generally speaking, different characters get different pieces of the plot. On the other hand, between this game and Rockman EXE 4.5 Real Operation, the player gets an impression of what an Operator and how they interact with their PET. This game takes place between Mega Man Battle Network 3 & Mega Man Battle Network 4. 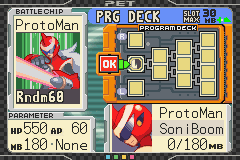 Program Deck: The only means of battling in the BattleChipGP. Very different to the main series, it's set up as a sideways pyramid. See the image below for an example. In the main Pokémon series, the Rival character usually starts off with you right at the beginning of your adventure in a way that really shows why you should want to beat that person. In this game, the rival Ronald isn't nearly as dynamic a character as either Blue/Gary or Silver. Because this game isn't linear, Ronald appears as certain event flags are set (usually gaining a certain number of Medals), rather than waiting at specific locations. In fact, during the opening at the Mason Lab, no hint is made by Dr. Mason or Sam that Ronald even exists or why he is your rival. So let's talk about these rival encounters! Mark's first encounter with Ronald occurs the first time he enters a Card Club. As you enter the Medal Room (AKA the entrance), Ronald walks down from the main area. After you meet, he boasts that getting the Medal of that club was "easy" (which can make very little sense depending on which club you enter), and then asks if you're trying to inherit the Legendary Cards. Answer Yes or No, and he lays out the basic structure of the game: Challenge the Clubs, get the 8 Master Medals, head to Pokémon Dome to challenge the Grand Masters. He then leaves without battling you. After you've claimed your third Medal, as you walk down to the Medal Room to exit the Club, you'll face off against Ronald with his "I'm Ronald!" Deck, a Water/Fire/Fighting deck that's fairly balanced. You get one shot at this, so watch out for things like Lapras' Confuse Ray and Dewgong's Aurora Beam. Gust of Wind will be helpful here, switching into weakened or energy-starved Pokémon and beating them before he gets a chance to attack. When you win, he gives you the Promotional Card, Jigglypuff Lv. 12. When you get your third Medal, the Challenge Cup opens in the building at the top of the map. You want to finish the Challenge Cup - the prize is Mewtwo, Lv. 60. Ronald is the third competitor, with his Invincible Ronald deck, a Grass/Fire/Fighting deck. His strategy now focuses on using beefy Basic monsters - Chansey, Scyther, Magmar, and Kangaskhan, along with a few others. Watch out for Kangaskhan's Fetch, since while it does no damage it gives Ronald a card advantage, helping him play energies to his benched cards. Like the first match, try to Gust of Wind into weaker cards without Energy early. For beating Ronald in the Challenge Cup, Mewtwo, Lv. 60 will be yours. The Legendary Rival Duel! - Battle #5! This page was last edited on 21 January 2019, at 13:18.